Knowing what a paint is capable of helps you select the paint that will properly cover your garage walls. With prices ranging from $20 to $80 per gallon, it's important to select the right type of paint for inside your garage the first time. Acrylic latex paints not only have the latex for flexibility but they also combine an acrylic to harden the finish. The acrylic creates a shell that keeps impurities from bleeding from behind into the paint and resists airborne gases and dust from sticking to the paint. This seemingly impenetrable barrier also lets humidity pass through resisting cracking and peeling, unlike oil based products, while containing fewer Volatile Organic Compounds (VOC) which makes it better for the environment and you. Low VOC paints mean less noxious smells and a quicker turnaround to get everything back in your garage. Exterior acrylic latex is a great solution for the unstable environment in your garage since it is easy to wipe clean and resists particulates sticking to its surface. The garage is pelted with dust and chemical fumes from work performed that will never happen in an interior home environment, so you will want to protect your walls with a paint that will repel this abuse and last a long time. With large fluctuations in temperature from freezing to sweltering in most garages, you need a stronger resistant material that will repel and cover blemishes that may attack your paint from either side of the wall. Exterior paint can handle this need. The best time to use interior paint on garage walls is when the garage is enclosed to provide a year-round temperature controlled living area. Interior paints are used primarily for areas that are temperature and moisture maintained within a very small range of 10 to 15 degree differences. These paints may be able to handle the large fluctuations in garage temperature and humidity at first, but after a few years they will flake and peel which will not be covered under the manufacturer warranty since it is not technically inside. 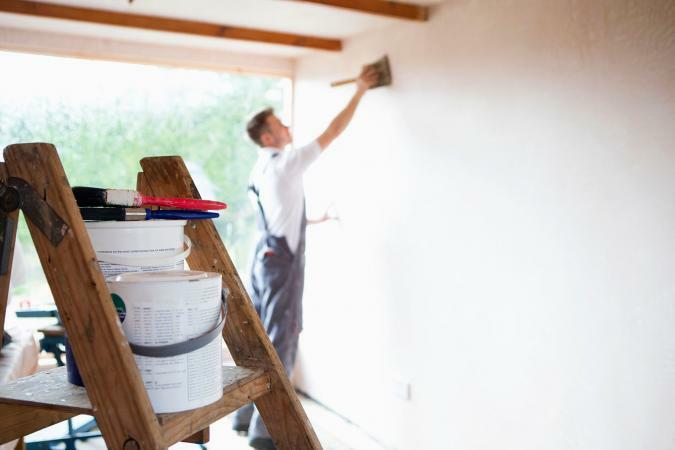 This will create more costs for you and with relative costs of interior versus exterior paints being minute, it's more beneficial to use exterior paint on your garage walls. All acrylic latex paints contain solvents which keep the paint fluid and dissipate as they dry. Solvents and some additives can be added to decrease dry time for convenience, but they may also be filling your paint can with a bunch of air. You want to be sure that the paint actually has volume that prevents you applying coat after coat, and the way to do that is check your solids. Paint manufacturers should have product data sheets which describe everything in your paint. These are not in the paint section but online at the manufacturer website. Data sheet information usually mentions weight solids. The higher the weight solid the less coats you will need regardless of how many square footage of coverage the sheet claims. The product may say it covers up to 400 square feet but as soon as all those chemicals evaporate you are left with bleed through and overlap. Consumer Reports' strict testing combined with Consumer Search's consumer input helps strip these top rated brands from the rest of the competition. This Old House reiterates the importance of warranty and solid content when choosing a paint brand because these two factors determine confidence in the product and resulting thickness when dry. 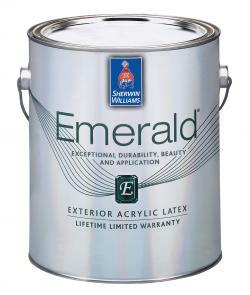 Sherwin-Williams Emerald and Duration - With a large price tag of $68 - $72 per gallon and a consumer rating close to 5 out of 5, Sherwin-Williams seems a bit expensive but solid. Their warranty protects the homeowner and Sherwin-Williams also extends the warranty to a third party application so a contractor can apply the product and they will still cover the warranty on your home. Product descriptions are thorough with weight solids at 58 percent and explicit descriptions for all forms of surface preparation before application. Valspar Duramax - With a reasonable price of $35 per gallon and a consumer rating of over 4 out of 5, Valspar is inexpensive and quick drying. Customers mention multiple coats for coverage and product adhesion issues when cured in some cases. Warranty only covers the owner and product descriptions are thoroughly documented with weight solids at 48 percent. Explicit directions for most surface preparations before application are also available. Benjamin Moore Aura - With a price tag of $70 per gallon, this zero VOC paint resists mildew, stains and fading with a wide array of color selection pushing it to the front. The 25 year warranty covers the proper application for the home owner only but with vague multi-surface preparation instructions and weight solids at 48 percent, many Amazon consumers rated this product as fairly average. However, high reviews from Consumer Search and Good Housekeeping hold Aura as one of the best. Sherwin-Williams SuperPaint - With a price tag of $51 per gallon, this low VOC paint has limited color range and is vulnerable to freezing temperatures with rare consumer reviews. Weight solids are at a high 55 percent and it has a warranty that can be attributed to the owner from a third party application. As a whole, Sherwin-Williams interior paints are a real contender which J.D. Powers rated "Highest in Customer Satisfaction Among Interior Paints" for 2017. Oil based paints can be either alkyd- or linseed-based, with most being dual purpose interior/exterior because of their ability to seal surfaces. Alkyd is a synthetic oil predominant in paint products because of its durable and inexpensive nature as opposed to linseed's natural but less common appearance. With quart size cans costing in excess of $10 a piece and cleanup involving solvents such as turpentine or mineral spirits, oil based paints are hard to manage but their robust nature make them great for small surfaces that see a lot of action. Garage trim, doors, and metal surfaces may have oil-based finishes because of their rough handling. With many leaps in water-based paint technology, oil paints are quickly fading but there are certain times you will want, or even need, to use oil-based paints. One primary reason is when the previous paint was oil based. No matter how you prepare a surface, a water-based paint will not adhere to an oil unless you strip off the previous paint, which can become a pricey project. Oil based paints are very durable and hold up well to high traffic areas such as trim or doors. Oil from your hands will mark these coatings so a tougher oil based product would be more beneficial beside a light switch or door handle in the garage since it is easier to wipe marks away. The garage is an unstable environment that you must protect against the formidable elements that attack it regularly, from the weather to yourself. Whether you have a metal, block, or drywall garage, heated or simply off by itself, temperature changes and humidity can expand or contract your walls making blistering and peeling a problem for oil-based paints. Paint companies have combined alkyd and enamel paints to create a water-based concoction that stands up to tough abuse and is easy to apply. While these blends are making a name for themselves it is still unclear if they are easily painted over with paints that aren't oil based or even how well they hold up over time. 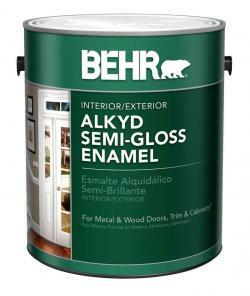 An alkyd/enamel blend that gets high marks from consumers is BEHR's Alkyd Semi-Gloss Enamel. The self-leveling properties of an alkyd with easy cleanup of a water base help rate this a 4.6 out of 5 stars with almost 90% of consumers recommending this product to a friend. Slow curing time, which is common with alkyds, was a major concern but overall covered well on many materials including brick, metal, and drywall. The best solution for any type of interior garage wall is really determined by your use and environment. There is not a single type or brand of paint that could cover all the possible scenarios but narrowing your options will help protect your investment and look good for years to come.